Rilastil Aqua Face Cleanser delicately removes skin impurities. 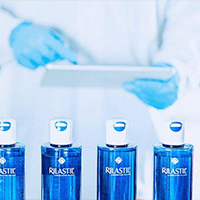 Rilastil Aqua is the complete product line for skin moisturization, to keep your skin fresh, tonic and to prevent wrinkles. For an effective moisturizing action, the Rilastil Aqua line envisages the daily use of the cleanser combined with the face cream (LEGERE for mixed-oily skin or OPTIMALE for dry skin) and with the mask twice a week. The recommended treatment is able to restore the proper level of skin moisturization (Hyaluronic Acid with high molecular weight for superficial moisturization and with low molecular weight for deep moisturization) and make the face skin bright and soft (Evening Primrose Oil with Omega 6). INGREDIENTS: Aqua (Water) · Polysorbate 20 · Sodium Lauroyl Sarcosinate · Ceteareth-60 Myristyl Glycol · Glycerin · Cocamidopropyl Betaine · PEG-3 Distearate · Sodium Cocoamphoacetate · Lauryl Glucoside · Sodium Methyl Cocoyl Taurate · Coco-glucoside · Glyceryl Oleate · Xylitol · PEG-7 Glyceryl Cocoate · Butylene Glycol · Oenothera biennis (Evening Primrose) Oil · Sodium Hyaluronate · Hydrolyzed Hyaluronic Acid · Sodium Lauroyl Lactylate · Ceramide NP · Ceramide AP · Ceramide EOP · Olus Oil (Vegetable Oil) · Phytosphingosine · Cholesterol · Butyrospermum parkii (Shea) Butter · Tocopheryl Acetate · PEG-150 Distearate · Citric Acid · C12-13 Alkyl Lactate · Carbomer · Xanthan Gum · Tocopherol · Hydrogenated Palm Glycerides Citrate · Lecithin · Ascorbyl Palmitate · Sodium Chloride · Pentaerythrityl Tetra-di-t-Butyl Hydroxyhydrocinnamate · Phenoxyethanol · Chlorphenesin · Benzoic Acid · Ethylhexylglycerin · o-cymen-5-ol · Disodium EDTA · Tetrasodium EDTA · Parfum (Fragrance).